Score a deal! Bid on Instagram through December. Due to my recent pregnancy, then arrival of twins, I have not been able to get out into the public to share my work lately. During the month of December, I will auction off 12 pieces of work. Some pieces are new and a few are ghosts from Christmas past. You will find a range of styles and media. I recently rediscovered my love of acrylic painting and have also taken an interest in chalk pastels you will find a some pieces of each.. There will also be a few watercolor that you may have been accustomed to seeing me make in recent years. Shipping in USA is included in the opening bid. Auctions will run for 48 hours. The winner will be asked to pay via PayPal. Some auction items to preview below! Double pears. Watercolor on rescued wood. Measures 6x9 inches. Bidding will start at $30. This piece has been mended. There is a small crack in the wood where it was once securely glued back together. 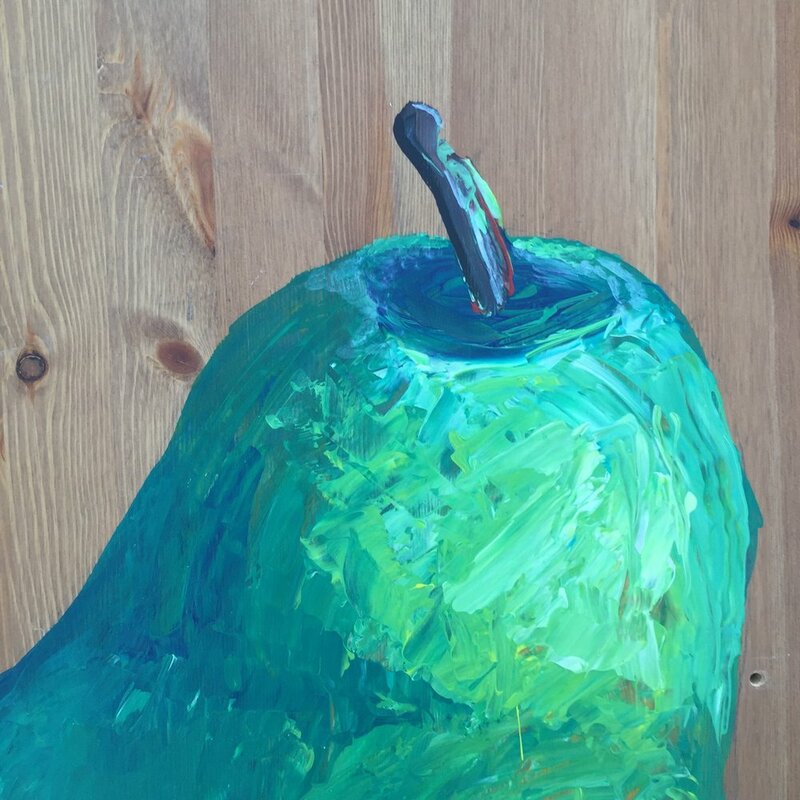 Detail of “ Mondo-pear” Acrylic on rescued wood (old table-top). Measures 19 x 29 inches. Ready to hang. “Cactus with bloom”. Acrylic paint on rescued wood. Measures 8 x 11 inches. Ready to hang. “Prickly Pear” Acrylic on rescued wood. Measures 5.5 x 5.5 inches. Ready to hang.